I'm feeling Halloween on this crisp October morning and so started off on a web hunt of vintage momento mori-- skulls, whose use as a motif in jewelry and other decorative objects served as bracing eventual portraits of their owners. But the skulls will have to wait until later this week (they're in no hurry anyway). 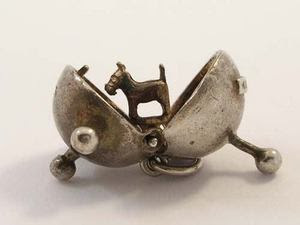 For the hunt got completely sidetracked by this vintage silver charm, which I think is everything a charm ought to be. Beautifully crafted, evocative, mechanically cunning, and ultimately touching. It is a momento mori as well, but of canine fidelity rather than of human transience. The charm portrays Sputnik 2 and its payload Laika, who was the first animal in space. Her not-terribly-long survival in orbit was nonetheless sufficient to convince space scientists that an animal could withstand the forces of launch, and so she marked the way for all future human efforts beyond the atmosphere. Given her sacrifice, there is a monument in her honor in Russia. But far better to be memorialized in a charm as beguiling as this. It deserves center stage, on its own on a bracelet or as a pendant. That way, in response to the inevitable inquiries, her story is retold, and her death, in the cause of mankind's greatest exploration, remembered. Aaah - did you buy it? I remember Laika. I was at primary school; we all admired her bravery. But realistically were more entranced by the prospect of exploring 'space' ourselves! I wanted to be an astronaut like many little girls of my age in post-war Britain, especially those whose fathers were in the RAF. (How wrong the sexist reportage of the age). My friends and I devoured science fiction novels - we thought it was the future. How sad that it rapidly became the past. yes Reader, I did . . .
my boys are fascinated by all things cosmic, so I'm predisposed to things like this . . . I was looking up Laika memorabilia on ebay and saw a charm like this. I googled it and found a charm like this for very cheap on another website and on ebay it was very expensive. Where did you buy yours and is it authentic or how did you determine the authenticity?